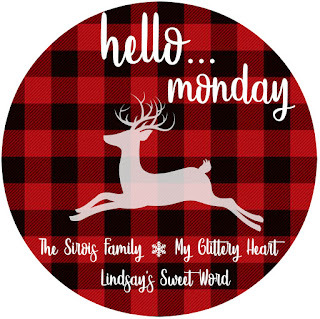 It's already the first Monday of December and you know what that means? 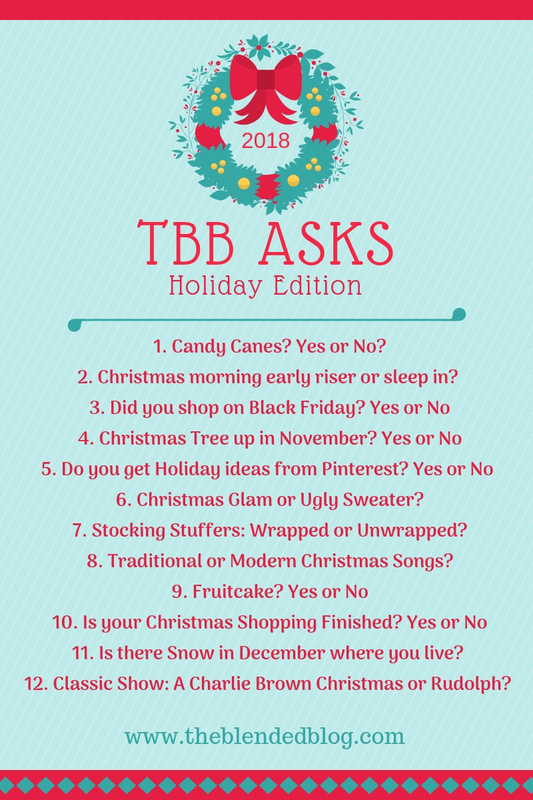 It's time to join the lovely ladies at The Blended Blog for their monthly Asks segment where they ask questions and we provide answers. 1. Candy Canes? Yes or No Oh, yes I love anything minty and my guys love anything sweet or fruity flavored. Usually we start with two boxes on the tree and I buy a box just about each week! 2. Christmas morning early riser or sleep in? With three boys we're up early! Usually we are up and around the tree by 6/ 6:30 (I try to hold them off until then!) regardless of how late they stay up the night before. And they are this awake and chipper too! 3. Did you shop on Black Friday? Yes or No Nope. I honestly don't even remember to head on-line and check out those deals. 4. Christmas Tree up in November? Yes or No Yes! We have a fake tree and we always put it up the day after Thanksgiving. 5. Do you get Holiday ideas from Pinterest? Yes or No Absolutely! I get holiday crafting/gift ideas, recipe ideas, decorating ideas, etc. You name it and I probably found it on Pinterest. 6. Christmas Glam or Ugly Sweater? Neither. Around here Christmas is quite casual and everyone wears whatever they are most comfortable in. 7. Stocking Stuffers: Wrapped or Unwrapped? I will wrap a few of the larger/ more expensive stocking stuffers but mostly we keep them unwrapped. While I don't mind wrapping I don't enjoy it THAT much. 8. 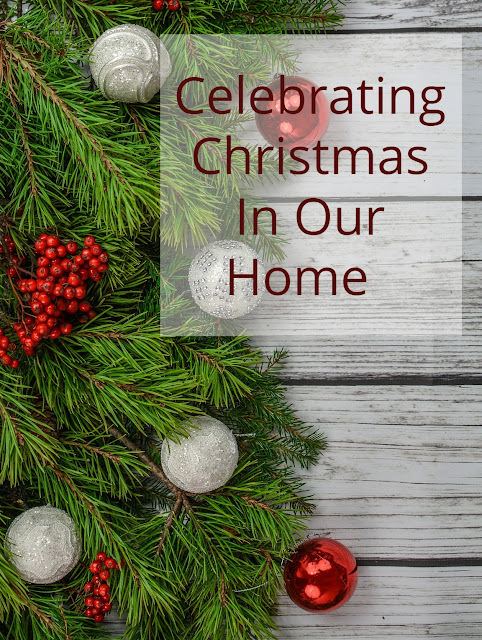 Traditional or Modern Christmas Songs? A good mix of both. There are some songs that I just love in their original forms and others that I like the re-makes of better. It depends on the beat, the pitch, and how easy they are to sing along to. 9. Fruitcake? Yes or No Oh gosh, never! 10. Is your Christmas Shopping Finished? Yes or No? My boys haven't written their letters to Santa yet and I've learned to wait because they always end up changing their minds before it's actually written. But other then the 4 men living in this house... I am done! 11. Is there Snow in December where you live? Almost always. The last few years it's been kind of weird with some warmer temps in Dec. So far it looks like this might be a snowy and cold year. We woke to this snowfall just a few weeks ago! 12. Classic Show: A Charlie Brown Christmas or Rudolph? Honestly, I am not a fan of either one. Grab the graphic if you'd like to join us! I love your view. WOW! I also love that you wrap some stocking stuffers and leave some unwrapped. How fun. I do not like fruit cake either. Enjoy your week! Aw, thank you! We are quite blessed to have our house here.